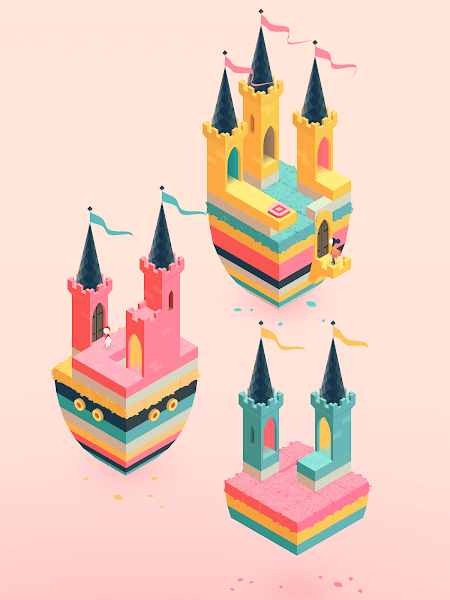 Monument Valley 2 – In the entertainment industry today, people are inventing and developing high-end gaming products, such as FPS shooters, open world games, or MMORPG role-playing games. Besides, trivia games have also received a lot of love from players, such as Limbo, Little Inferno, Cut the Rope 2, and Monument Valley 2. I will introduce you to this article a little casual game like that. 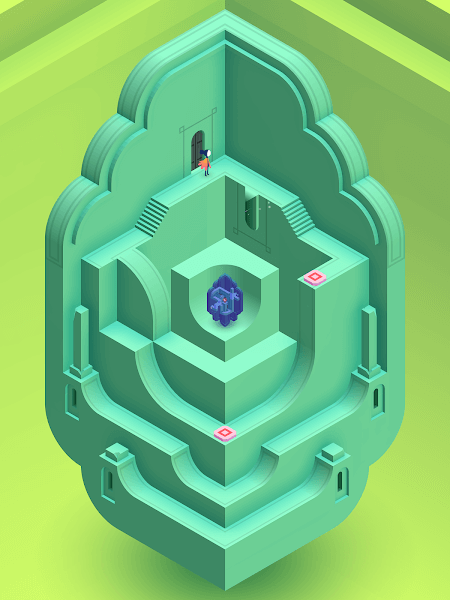 After the spectacular success of Monument Valley 1 – the game received the best graphics award of the year. The publisher of two games continues to develop its child. What version of this will you be experiencing? Let me go into the story! 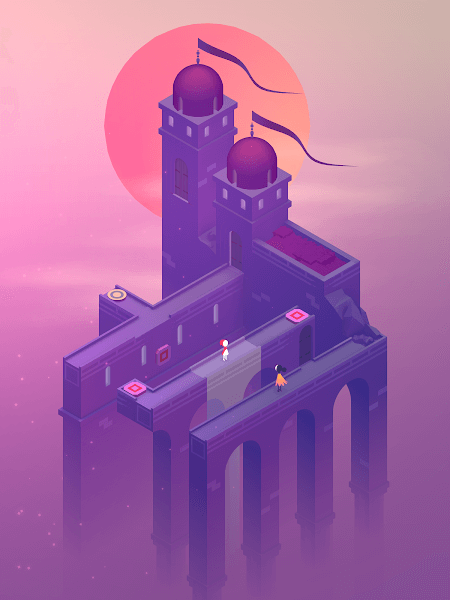 Monument Valley 2 tells the story of a journey back home of Ro and little daughter. Ro with her girl was lost in a maze, where the buildings are incredibly complex and hidden mystery. She realized that structures were continually rotating and changing over time, but they could not understand how to operate them. Can you and your daughter leave here, and return home peacefully? Involved in the game, you will be role-playing Ro. Your task is to find the exit in the maze, to take her daughter back home. The labyrinth is designed in many layers, each of which has architectural works, and hidden traps. You must pass each level of the maze in order to escape from here. At every stage of the game, there will be strange messages, and you need to find it. The game does not have a guide or a text for your reference; you must find out the mechanism of rotation of the work, to bring the two characters out of the three-dimensional space is continually changing. In different stages of play, the play space is turned, so the operation mechanism of each maze is different. You need to find the angle, to find a new path, lead you out of the maze. 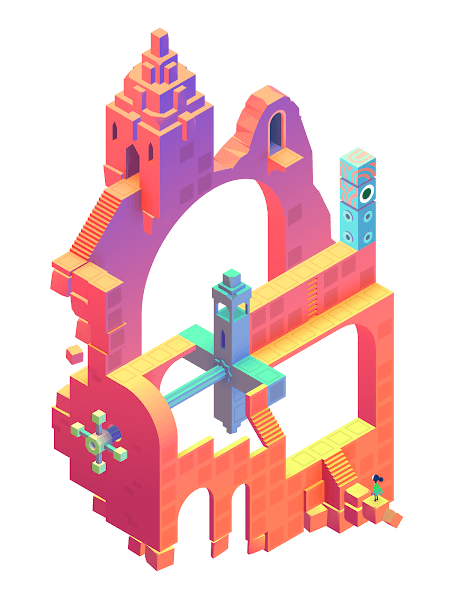 Monument Valley 2’s graphics are boldly artistic and are more innovative than their predecessors. You will still be immersed into space with many unique architectural designs, meticulously designed, sharp and decorated in harmonious colors. Besides, music is also part of the success of this game. The background music is very calm, cooperative, and is played throughout the game, suitable for you to relax the mind. Overall, Monument Valley 2 offers players a memorable experience with an incredibly engaging plot and storyline. Game mechanics are also elementary, but to overcome the high levels, players need creative, imaginative and good thinking. Currently, the game is being released with a discount price of 23,000d; you can spend a small amount, is able to own this unique product.